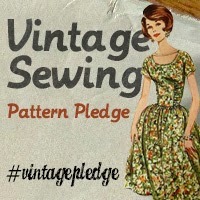 Vintage Sewing Pattern Pledge - will you join me? Ooh im totally up for this! I'll go for 5 too - sounds doable! Will you be a bit scary like the mistress of the jar? Might make me stick to it! Ahahaha! Considering I didn't complete my Sewlution and probably pissed the mistress of the jar off, I'm not sure how strict I can be ;o) But I'll try to keep people motivated...thanks for joining in!!! So cool ! You have some awesome patterns in your collection..
Great idea Marie! 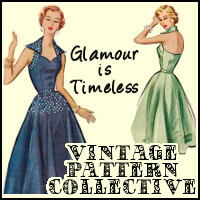 I posted my first vintage pattern of the year last week. A 1976 wrap dress. Oh my goodness! They are gorgeous patterns! I'm loving the mcalls blouse 7844 pattern. Lovely vintage patterns you've got there! I have a few lovelies so I'll join you in the pledge though I don't think I'll be so bold as to put a number on it! I'm sure you'll find plenty of people who are keen, I'm looking forward to the round ups already! No need to put a number on it, even making one would be dandy ;o) I'm glad you're on board! Gosh those patterns are gorgeous! I only have one shoebox of vintage or retro patterns (and hundreds of vintage Lutterloh), but I'm in. Most of my patterns come from charity shops which means I'm desperately waiting for the boxy '80s look to come back (complete with shoulder pads! ), but I'll go 5 patterns too. Yay, pleased to have you on board!!! YES!!! I pledge at least 5. Oh, I love how detailed your plan is! Thanks for putting so much thought into it, can't wait to see what you make! What an awesome idea! I get side tracked by all of the fantastic indie designers out there! I'm going to pledge to make 3 this year. A few less but it's achievable for me. I love your collection! I might have to actually get some vintage patterns first! I only own one pattern that wasn't downloaded - one! There are some beautiful vintage patterns I've been looking at on Etsy in my size though, so if I end up buying them I might join in! Wow! How cool! Love that first dress! I'm awful about sewing them, too-- I have a disastrous muslin of a '60's dress wadded up in my sewing area where it's been sitting for months. Yikes! I love this idea! In part because I want to see you sew up some of that amazing looking fabric and some of those patterns! ;) I think 5 sounds like a good do-able number, too. Can't wait to see what you come up with! Thanks Tasha! 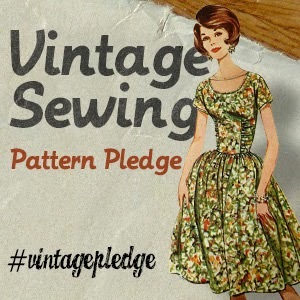 You don't need a pledge as you're a legend at sewing (and knitting) up vintage! Wow, you have such a great collection - I'm super jealous. 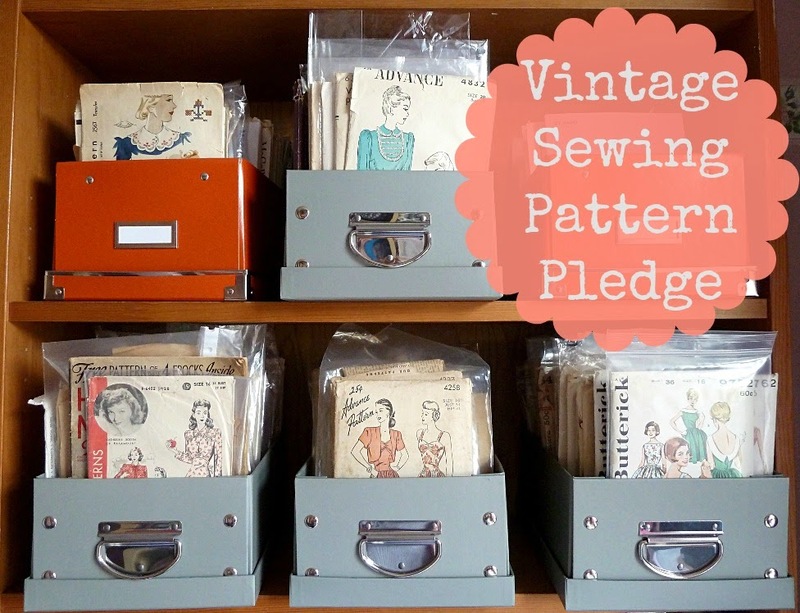 I don't have much in the way of vintage patterns myself so I won't take the pledge (if anything, I need to buy more vintage patterns! I have three, and one is an apron), but I'm in the process of sewing a 1950's formal dress for my high school graduation, so it's guaranteed that I'll make at least one item from a vintage pattern! Feel free to share your 50s dress with us for inspiration! Wow that really is quite the collection you have there! My stash definitely isn't as impressive as yours but I still have enough patterns that get looked over in favour of trends. I think I'll join in with 4 for the year- one every 3 months seems reasonable! Lovely, I like your thinking! Hi (I'm a new follower from NZ). This could be what I need..I have been collecting vintage patterns for years and I have never, ever, made one up! Welcome Carolyne! I hope you end up joining in! You’ve got some beauties in there that I would be happy to have! What company/number is the one with the ruching on the side of the bodice? That’s a great fabric pile too. 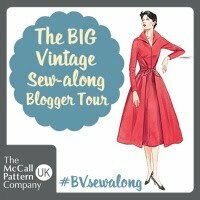 I don’t have many vintage patterns myself so can’t take part, but look forward to seeing what you come up with. Count Me In! My goal is to sew a garment every month. January didn't work out as I've had to take the pants I'm working on apart twice so far (don't sew when you're not feeling well!). My 15 year old daughter has asked for Vogue 2765 from the 70s. Love this coat so much I may have to make one for myself :) Thanks for having such a fun challenge! Wow, one a month is a brilliant goal! I look forward to seeing what you come up with!!! Yes!! This is fantastic! Yay for vintage patterns! What a good idea! I'm definitely joining in! Ehm, especially since I just ordered another two vintage patterns to my collection.. But they're so pretty! Hehe, great to have you on board Naomi! Love the idea and love your patterns, especially Simplicity 2781 et Mc Calls 7844. I only have 2 vintage patterns so far but it is only the beginning of the collection. Sew vintage is definitely one of my goals for 2014, so I'm in ! Excellent Camille, even if it just means sewing your first vintage pattern this year! Hey, great idea! I will try 4 pieces - each for every season! I have some old patterns and some repros and also a Lutterloh book. I always love to look to this treasures. Now I will aim 4 and hope to admire your projects here on the blog! Yay, one for each season sounds like the perfect approach! Yes, jolly idea I say! Hope you blog and show us. Wow, I'm impressed by your number of belladones and elisalexes to be fair!!! Good luck with 5 vintage patterns this year, we'll have to keep each other motivated! Ahhh - you have such gorgeous vintage patterns!!! I wont join in because I have discovered that I just CANNOT stick to plans I make about sewing, but I'm looking forward to reading all about yours. Oh and can I vote for you to take a photo of each of your vintage patterns and post them on your blog (perhaps not all at once! ), so that we can admire them??!! No worries Suzanna, I totally understand and I'm the same! But I'm hoping to stick to this plan as I've gone and invited the whole world to join in ;o) Photographing all my vintage patterns could take a while...but it would be fun and maybe I could stick them on Pinterest!?! Really looking forward to seeing what you come up with! oooh! You have a wonderful collection!! I only have a couple of vintage patterns at the moment, but you've inspired me to start a proper collection! Yay, excellent! I've pinned your skirt already http://www.pinterest.com/stitchodyssey/vintage-sewing-pattern-pledge/! I'm in! I love sewing with vintage patterns, and hopefully five in a year's time will be doable. Not sure which patterns I'll be using yet, but that's half the fun, right? Absolutely...enjoy picking out your 5!!! So great of you to commit to vintage, unfortunately I don't know if I can commit to 5, my last vintage pattern attempt was such a disappointment, I should get back on the horse though! I can't wait to see your vintage makes! No need to commit to five, you could just aim to making one you're happy with this year ? The patterns in this post are gorgeous! I'm in too! :) I'll have to pick out a few from my teeny pattern library - there are a couple of my grandmother's that I've been looking forward to trying (but am a bit daunting by) - but chalk me down for three. Great project! Three it is! Can't wait to see what your grandmother's patterns are like! What a great idea. I have so many that I need to use although they are not as pretty as yours. I'm on board but I think I'll go for 4. Now, this sounds like a plan! I have lots of vintage patterns, and I tend to stick to just a few, will have a proper look through my patterns and make a list. I can't believe how quick off the mark you've been missus!!! Great idea! I have been sewing a lot of repro patterns lately, even though I have boxes of vintage. I feel bad using them! They are too pretty. But it seems wasteful to just have them sitting around, so I am IN! Yesss, join the club Amy! Oooooooh I want to do this - I don't have many vintage patterns but I'm trying to get one made at the moment (I have two muslined). I expect to have more time to sew in a couple of weeks, so I'll just take the plunge and steal your badge to put it on my blog. Yay, taking the plunge feels go, no!? 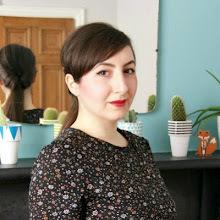 I'm in love with your Vogue 5510 pattern (I've always admired it from the top of your blog) - if you don't get around to sewing it, send it to me and I'll sew it up and let you count it as one of your 5! Haha, that's a deal Lizzy! I'm in. I don't have a blog nor twitter nor instagram nor facebook. But I'll be glad to play/sew along. As you know, I have lots of patterns. I actually have my own personal stash that I need to get sewing. Excellent, thanks for joining in! You can always email me pictures of your makes if you'd like me to include them in any of my roundups! Oooh, interesting...can't wait to hear/see more! Hmmm. I was just tossing my drawer of vintage patterns looking for something and realized I have quite few. And I bought them because I thought they would look cute made up. So this is the kick in the pants I need. Count me in! Woohoo, good to have you joining in! I am in. Now to decide which one to start with. Fifth one down! The pencil skirt version....THAT would look gorgeous on you...perhaps with a SLIGHT tulip shape to the skirt....in a teal or deep emerald coloured wool crepe....shall I stop now? Sorry! Great idea by the way! Fabulous, thanks for joining in and happy pattern shopping!!! I'm in! I have an expansive collection of vintage patterns that I am planning to work through eventually, and it will be nice to have a group to work along with and be inspired by! Great attitude, exactly how I was hoping people would react! I'm on board, and am just about to complete my first project of the year, made from a frankenpattern of a 60s crushed boatneck top and a vintage Lutterloh pattern. I have a number of Spadea designer patterns and am planning to do a rare Claire McCardell pattern next. Last fall, I made a jacket from what is probably the only officially licensed Chanel pattern, from 1962. I'll probably do another jacket from that pattern, as well as a Ceil Chapman dress (another Spadea pattern). I also have a Schiaparelli pattern from Vogue that's in the hopper. Sounds like fun! Go on then, I'm in. I have so many vintage patterns but I always get distracted by all the new stuff. It's about time I sewed from my pattern stash. 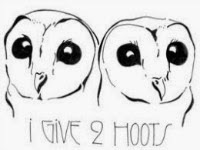 I'm struggling for time at the moment so I'm going to commit to three, and any more will be a bonus. Yay Jo! Exactly the reason I set the pledge up in the first place! Ha I am glad I am not the only one! That is a LOVELY stash of patterns. I think the clue is in the F word you mention. Fitting is always an issue. I started a dress a few years ago with a bust of 34" which matches my high bust - should be fine but it gapes like mad. I will not be doing that one. However, I have a few that may not present too many problems - namely shirt dresses of which I will do at least one. I'll join! I have so many patterns that I want to make and wear. Can't wait to see what everyone makes! Love this idea. I think I'll pledge 5 as well, not too overwhelming a number but not so little as to let myself off easy! My thoughts exactly on that number! Thanks for joining in! Two for me. I haven't sewn with a vintage pattern yet just been collecting them! Woman, are you independently wealthy, LOL!!! I am new to all this vintage sewing stuff and by golly I can hardly afford vintage patterns AND not many good ones in my size (IMHO). Excited though to see someone with this many vintage patterns. How cool is that? For what it's worth, if I had a skosh of vintage patterns I'd join ya. Oh, and I did complete one today, by the way. A 1950's shirtwaist. Oh, I meant to ask . . . where did you find the way cool storage containers? I like them; neat and organized looking. I think I got the grey ones from Ikea actually...the others were from some random stationary shop...I think! I'm in! I'll do 12, one a month.... yikes, but I think I can do it! I have just blogged some of my new to me vintage patterns, so I'm excited. I'm totally biting off more than I can chew but I'm in to the tune of 1 vintage pattern. I may fail...but at least I will have tried! My Mum recently gave me her patterns. She wasn't into it in a big way but had some and usually my Nan sewed them up for her as she was a professional seamstress. There are definitely a couple I'd like to have a go at. I haven't photographed them yet for my 'catalogue' (it helps me stop buying doubles!) but once I do I'll pop back with a link to the one I choose first! Look forward to seeing your results! Goodness! Please do share your bridesmaid dresses with us, how exciting! And thanks for joining in with 4!!! It took me a bit longer than I expected to come here and post this, but, as I already mentioned on We Sew Retro, I'm in and I will also sew up 5 vintage patterns from my collection in 2014. Reflecting that collection, I want to try and pick something from each decade from the 1920's to the 1970's. I love that you're going to try and reflect a different decade with each pattern, thanks for joining in!!! oh i would love to do something like this but to be honest i am not finding any vintage patterns in my size. am really wanting to find something in the forty's but am really short waisted as well so i dont know what might work.. i have done period clothing 1860s & 1830s and am trying 1870s but i would love to find something in the 1900's :) -- can you suggest where i might find something that might work?? I think your best bet would be searching Etsy! You can put the period of sewing pattern you'd like to find in the search box...along with size too (although that may not provide the most accurate results as it may restrict them a little). Woohoo! I can't help but feel you've been bullied into this, but I'm so pleased to have you on board! This must be serendipity... I have a ridiculously huge collection of vintage patterns. I was looking at them yesterday, and thinking that I really want to sew more of them, partly because I really want to wear them, and partly because I think it would be really sad if they just languished there and were never made into actual garments. So yesterday I re-traced a dress I had started previously (having had an idea about how to solve a fit issue). Yay, how exciting! Please do come back and share your finished makes! Can we use Repro patterns? The only vintage I have are 70's and 80's-does-40's that are really not my thing, but I have enough Repro Vogue's and Butterick's to get me going! Great idea!!! I'm in! but just don't know how many will I sew, perhaps just three. I'm in, with two patterns. Great incentive, thank you! I pledge to do two patterns for 2014. Count me in with 3 patterns. Thanks for the push Marie! I am so in!!!! Have alot of vintage patterns, and this will give me the nudge to get busy sewing them! If I commit to a certain amount I know I won't , but one or two at least just to get started. Excellent, just do it whichever way suits you! Great idea, I'm in! I recently bought a couple of vintage patterns and have been staring at them nervously. I am so in! I just got an entire box of sewing patterns from the 1940's so I'm itching to whip some out! I'm way behind on blogs and just saw this, but ooh! I'm in for five. I sew a lot from vintage patterns already, but tend to just make different versions of the same few over and over, neglecting all the others I have, so I'll try to make it five new-to-me patterns also. By the way, your pattern collection--so wonderful! Hey Marie! Great idea. I've got one ready to go, the post will be live on Saturday - I'll send you the link. I will commit to at least 3 - some for my twin girls, got some adorable little dress patterns, and some for me! Oooh, it's lovely that you'll be sewing for your twin girls...can't wait to see those outfits! Got my widget, I'm in. I'm planning to sew 3. Yay, fabulous! Thanks for joining in! I'm in! this is such a great idea! Between inheriting a ton of patterns from my grandmother and collecting them myself I have a huge stash of vintage patterns that are being neglected. I will pledge 5 too- hope I can do it! Fab, what a great idea Kristine! I'm in! I've got a few vintage (and repro) that I really want to use this year. I'm in for 4.
oooh this sounds fun... im quite new to this game and all I have vintage wise is one 40's and one 50's repro - ill pledge to make them both this year! I'm in!!! I have a ton of vintage patterns that need some love! This is brilliant (sorry I'm late!) and I'd love to join in please. I'll say three … Thank you for organising! Oooh fab, thanks for joining in! What a great idea! I definitely want to do this. I have so many of my Granny's vintage sewing patterns that I want to try and this will really inspire me to actually do it! Excellent, great to have you on board! I've just seen this from Kestrel Makes and I would like to join in!! Putting the button on my blog, now. I love the crossover back on that Vogue pattern! I know I'm a little late to the game, but I've got to join in on this pledge! I have a huge vintage pattern stash and it's high time I started sewing some of them! I'm going to pledge to make at least four vintage-pattern garments this year, and hopefully more! Thanks for this great idea! Fantastic stuff, glad to hear it! Amazing plans, can't wait to see them all unfold! I"m in. NOw where did I put my wonderful 70's gathered bodice dress pattern? 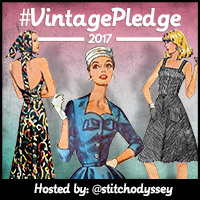 I just became aware of your vintage sewing pattern pledge via a blogger who had the badge on her blog. What a great idea! I shall join and some of my vintage patterns will finally get tested! I've been collecting for just about a year, and they are literally just collecting dust. I'd like to definitely put them to good use. The oldest patterns I have are from the 40's, and I'm very much looking forward to making some.